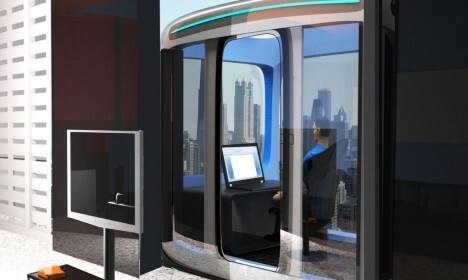 Minimizing your travel time and complexity between home and, well, anywhere else, this living-room-and-car combination takes you straight from a skyscraper condo to the streets of your city. Charles Bombardier, a mechanical engineer from Canada, worked with vehicle designer Ashish Thulkar to develop Tridika. 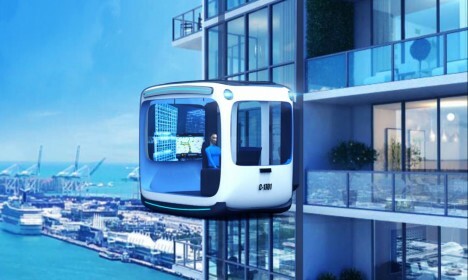 The resulting pod-like living room is secretly a maglev car designed to scale the sides of buildings and become an extension of your home (that also takes you away from home). 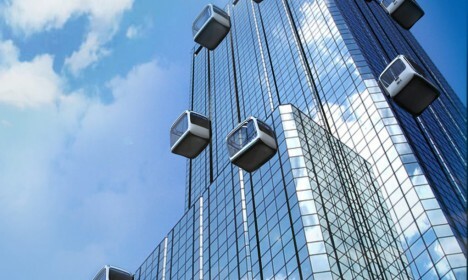 Using magnetic levitation technology, the room/car speeds along tracks, climbing buildings and descending to join other vehicles below. Like many driverless car concepts, it takes a vehicle-and-room approach, letting people who would be drivers sit back and enjoy the ride instead. As a bonus, it minimizes wasted space – when you are not at home, do you really need to leave your living room behind? See more in Unbuilt Concepts or under Technology. October, 2016.